Suzie and Sadie "Dropped Off" at the Shelter---Now in a Loving Home Together--Suzie and Sadie were left at the shelter by someone who claimed they happened to find them independently. The OC Shelter saw the bond between the two dogs and it was obvious they had lived together prior to being suddenly discovered as stray dogs. 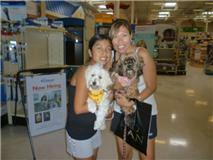 Ariel Rescue saved them from the shelter and brought them to the veterin...arian for complete checkups. Sadie 2 year Maltese/poodle mix is on the left and Suzie 3 yr lhasa apso/poodle mix on the right. In this economy, it is extremely difficult to place one dog, let alone two together. The financial burdens, as you know, of owning two dogs can be difficult. Fortunately, a single mother and her daughter adopted them together. Here they are--a new happy family.